If you happen to be in need of a Father’s Day gift, HTC is hosting a Hot Deal on its RE Camera and select accessories. For a limited time, you can get a RE Camera for $50 off, bringing the total down to just $150. Not a bad deal for the little periscope shooter. For accessories, HTC is placing items at 50% off when you purchase three or more. For example, if you buy a Dot View case, Car Kit, and Rapid Charger, your total will only be $67, instead of over $120. 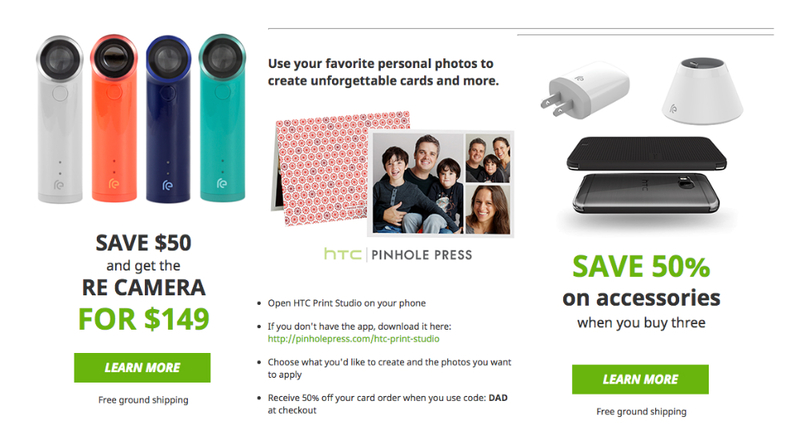 Lastly, HTC is offering 50% off HTC Print Studio card packs. If you want to save memories forever, apply the code DAD at checkout, then save 50% on the order. If you don’t have the Print Studio app already, you can download it here. If Dad happens to own an HTC device, or you have one and want to take advantage of the deals, follow the link below.